A second in the new recipe posts, the chipolte slaw that I use to to some amazing fish tacos. I have found that if I use brocolli slaw instead of shredded cabbage then my children enjoy it more. This makes for an amazing topping to fish tacos along with some guacamole… that recipe is to come. The first in what are going to be some new posts to post some of my and my families favorite recipes. This first one of marinated tomatoes comes to us from our wonderful friend Jennifer. They are simply a wonderful addition to a meal in the summertime when the tomatoes are at their peak. From a local ministry perspective, this past Easter was the first since I have been full time at Messiah, that is a learning experience of really understanding what work / life balance is. For those that have never been in employed full time ministry with at church, there as you would guess are two times that the work load goes up: Christmas and Easter. This does not discount any and all of the other worship services that happen throughout the year, but those are two key opportunities to reach out and there is extra effort placed in those times. If for some in America that are CEO Christian (Christmas and Easter Only) than that is a key and crucial time to pour the love and salvation message into everyone that enters in either physically or virtually. Virtually, what the heck do I mean by that? One of the first items that we took on at Messiah was to launch a live streaming worship experience. Messiah currently offers a live streaming worship service every Sunday at 9:30 eastern time. We have blown the doors of the church and said that no matter where you are in the world, if you would like to worship with this faith family, then join us in worship online and give glory and honor to Jesus just like if you were sitting in the physical worship center. Some time has passed now and we have most of the bugs worked out, a few more to go. I am so honored to be a part of getting it off the ground and seeing it start to take a footing. I was amazing the first time that we were able to witness someone through this streaming service give their life to Christ, that makes all the hours worth it. All honor to Jesus for a transformed life and I am humbled to be a part in it. If you would care to join it you can find it at Messiah On Demand. Have you ever been curled up in the fetal position wondering if you made the right decision to enter full time ministry? 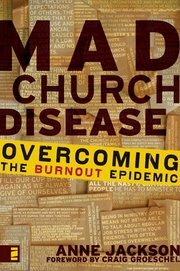 Anne Jackson brings this very issue to light in her book Mad Church Disease: Overcoming The Burnout Epidemic. Instead of internalizing the fears, anger, sadness, and other emotions that can sometimes lead to and result in burnout, she encourages us as leaders to look to accountability people who can help us see the path that God has for us and stay closely on it. Since I had allowed spending time with God to be replaced by spending time doing things for God, my spiritual tank had been sucked dry. When that happened, I began to lose perspective on almost every area of my life. My defenses were down, and I allowed myself to start believing little lies the enemy would throw into my path. Mad Church Disease is a well written path through the troubled road that one might walk in ministry. Anne writes from the heart with very authentic and real life examples from her own walk as well as friends that have walked the road as well. We applaud her courage for bringing the epidemic into the light and encouraging the rest of us to respond well to the challenges that ministry presents. Thanks Anne for aiding in keeping us aware of staying fully grounded in God’s Word and time alone with our Savior. Reading this has also helped us be aware others whom may be facing these challenges as they lead in their ministries. It reinforces the need to surround ones self with authentic accountability and ensuring that one takes time away to relax and recharge. We are recommending this book to our other ministry leaders that we serve along side. It would be well for every ministry team to read and understand what could happen and guard against it. That is an interesting title I think. I have been working on writing this one post for over a week now. I have been trying to ensure that I don’t write in anger, haste or to harm. Last week while working with a colleague who I am still trying to understand our working relationship, I was totally caught off guard by a comment that was made. The comment was in reference to a rumor that was in the mix about something I had possible stated. I was very quick to quelsh the rumor and ensure this person that I no way made the statements referred to in said rumor and assured the person of where I stood on their role in an specific area of service. Later that day in a working meeting I mentioned to a couple other staff members the said rumor to assure them that if they heard it to stop it in it’s tracks. Rumors are a vile communication and can tear teams apart if not dealt with head on. Well the fun keeps right on rolling at this point. I was then informed in the that there are more that this first colleague whom I supposedly was spreading rumors about feels that I am arrogant. At this point I was floored. I have never thought of myself as arrogant and to hear that someone perseves me that way was almost crushing. I went through lots of emotions from being sad, crushed, hurt, pissed, pity… I have spent some time away from the situation in prayer and with very close advisers and have resolved this in my heart and I am now to the place where I can write it. I am a confident person who attempts to walk humbly. I am not afraid to make mistakes while at the same time fear failure. For place of responsibility, I have to make well informed but sometime on the spot decisions and I don’t fear this. If the decision turns out to be the wrong one we correct the issue and learn from the mistake. I am not one that will sit for hours with a committee to make a decision that I feel confident in making under my areas of responsibility. In all of this I attempt to do it with humility. I know there are times in which I have failed and will fail in the future. So that is who I am. If you are perceiving someone to be arrogant, close the loop with them personally and directly… you might be dealing with a confident person and if so ensure they are serving humbly and for the right reasons. I am still working to cycle back and close the loop with my colleague, they are an amazing person whom I know I still have some things to learn from. Today while I was out running some errands I swung into a bridal shop to pick up a brides maids dress for my wife. She has the honor of being in the wedding party for her brothers wedding. On walking into the bridal store a very nice clerk greeted me and asked if she could help. Being a bit of a joker I stated that I was there to be be fitted for my dress… okay I was joking. With a very straight face she said, okay right this way. I was shocked to say the least. I informed her that I was joking with her to which she replied that is it common for men to come in an be fitted for dresses. I don’t claim to live a sheltered life, I just would not have thought it was a common place as this lady informed me that it is. Time over time I continue to talk and share the joys of using OpenOffice as an alternative to Office. Just today I was informed by a teacher in the Pinconning Area Schools that they have started to use OpenOffice as their tool for teaching. This teacher was just so thankful and raving about the joys of having OpenOffice in the classroom and able to have the students using it at home. The tool is open, free and great to use. I have been an OOo user for a long time now, I admit there have been bugs and it continues to get better with each release. An amazing story and I love telling the use of open source software and more. Tonight over dinner my three year old heard a sound coming from the laptop that sounded a bit like a buzz. Shortly following that she said “dan’s phone, would you like to call home or mobile”. I just started to laugh because I knew she was repeating exactly what she hears the bluetooth speak back if the voice dialing is being used. It was a great moment in parenting. This week is Thanksgiving here in the United States. Our family will be preparing something along the lines of the standard dinner… but I look more forward to the leftovers. 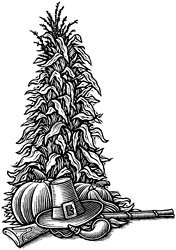 I look forward to making what I call the The Happy Pilgrim. What? That is right, I make a sandwich that we call the Happy Pilgrim, so what is it? For me it starts with two slices of good hearty wheat bread, lettuce, sliced roasted left over turkey, stuffing, gravy and cranberry relish. Oh, place that all together in a sandwich and it is like a meal in one. I was introduced to something similar from a sub sandwich shop while I was helping a friend move in Boston. Skip the meal and make me a Happy Pilgrim and I am one happy pilgrim. Try one this year and let me know what you think.